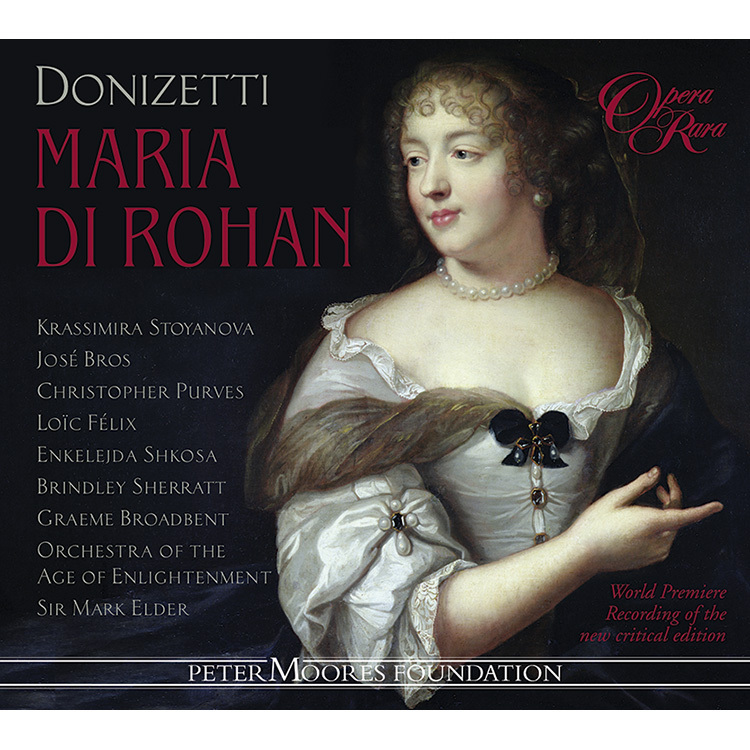 According to the late Donizetti expert William Ashbrook, Maria di Rohan (1843) is the composer‘s ‘tautest, most melodramatic opera’ and shows him ‘in complete control of his musico-dramatic goals’. According to the late Donizetti expert William Ashbrook, Maria di Rohan (1843) is the composer‘s ‘tautest, most melodramatic opera’ and shows him ‘in complete control of his musico-dramatic goals’. The tragic melodrama, composed in 1843, was one of the last operas written by Donizetti (he had notched up an impressive 62 by then). First performed in Vienna, Donizetti revised it for its Paris premiere, changing the tenor role of Armando di Gondì to mezzo-soprano. 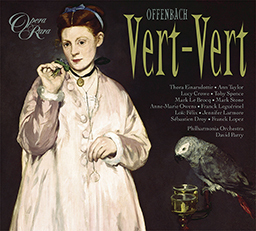 Working from the new critical edition of the score, Opera Rara has recorded the original Vienna (June 1843) two tenor version as well as some of the appendices from the Paris (November 1843) revision, including those written for the mezzo-soprano, sung here by Enkelejda Shkosa. Set during the time of Cardinal Richelieu, the opera focuses on Maria (Krassimira Stoyanova), secretly married to Riccardo, Duke of Chevreuse (José Bros), who has wounded the Cardinal’s nephew in a duel. In seeking assistance for his plight from Enrico, Count of Chalais (Christopher Purves), Maria finds her former love for the latter revived. The rest of the opera centres on how this intricate and explosive triangle of relationships plays out. As a handful of recent productions have demonstrated, the result shows Donizetti rightly claiming his position as one of the nineteenth-century’s greatest musical dramatists. The project marks Opera Rara’s second collaboration with the Orchestra of the Age of Enlightenment; the orchestra, choir and stellar cast are conducted by Opera Rara Artistic Director, Sir Mark Elder, bringing his customary musical intelligence and wealth of experience to this repertoire. José Bros (Riccardo), Christopher Purves (Enrico), Krassimira Stoyanova (Maria), Graeme Broadbent (Il Visconte di Suze), Loïc Félix (Armando di Gondì), Brindley Sherratt (De Fieque), Christopher Turner (Aubry), Riccardo Simonetti (Un famigliare di Chevreuse), Enkelejda Skhosa (Armondo di Gondì – appendix items), Orchestra of the Age of Enlightenment, Sir Mark Elder – conductor. 03 Maria di Rohan: Act I scena I: Ed e ver? 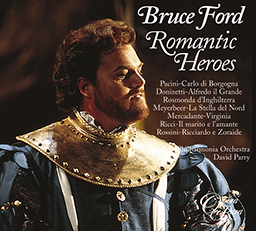 06 Maria di Rohan: Act I scena III: Cavatina: Conte! 09 Maria di Rohan: Act I scena V: Finale: Cavalieri! – scena VI: Amici ? 10 Maria di Rohan: Act I scena VI: Ma che! turbato sei? 12 Maria di Rohan: Act I scena VIII: Conte! 13 Maria di Rohan: Act II scena I: Nel fragor della festa, ahi! 14 Maria di Rohan: Act II scena II: Finale: Donna, che il volto d’una larva cinge – scena III: Maria! 15 Maria di Rohan: Act II scena IV: Ch’ei dorma? 16 Maria di Rohan: Act II scena V: Sedete ? – scena VI: Conte! 21 Maria di Rohan: Act III scena VI: Aria: Ebben? Riccardo, Count of Chalais, appears. After a long period of silence, he has received a note from the woman he loves, Maria, Countess of Rohan, a member of the Queen’s household, asking him to meet with her urgently. He does so, and she informs him that her relative, Enrico, Duke of Chevreuse, was some time since challenged to a duel by a hot-headed nephew of Richelieu, and killed him in the encounter. Now, in consequence, he has become the victim of a law forbidding duelling, and has been condemned to death. She beseeches Chalais, since he is high in the King’s favour, to intercede on his behalf: only he can save his life, but he must act swiftly since the scaffold is to be erected the following morning. Though he suspects that he may be interceding on behalf of a rival, Chalais promises to exert such influence as he can, and enters the King’s apartments to carry out his mission. Left alone, Maria reveals that Chevreuse is by no means simply Chalais’ rival: for the past year they have secretly been married. The courtiers take her to task for her downcast spirits, but when an usher brings her a paper which she discovers to be Chevreuse’s pardon, she visibly rejoices and is scarcely able to contain her sense of relief. Following her retirement to the Queen’s apartments, a young courtier by the name of Armando di Gondì enters, braving the King’s displeasure by appearing at court – and Richelieu’s vengeance, since he acted as Chevreuse’s second in the fatal encounter. He has no qualms, however, for he believes Richelieu’s fall to be imminent and inevitable. He is also contemptuous of the Cardinal since he considers him his rival: he has been assiduously but vainly paying court to a woman, only to see her entering Richelieu’s hôtel thrice in a single day. Asked her identity, he names Maria, Countess of Rohan. Chalais, who has returned in time to hear this, is deeply offended that the name of the woman he loves should be bandied about with such levity, and immediately challenges Gondì to a duel. Gondì accepts, but further parley is interrupted by the appearance of Chevreuse, just released from custody. He greets Chalais as his liberator, and, hearing of the impending duel, offers to act as one of his seconds. The location of the encounter is fixed for the Tour de Nesle at dawn the following day. Maria brings news that Richelieu’s fall from grace is now a fait accompli – she has just received the news from the Queen herself. It is now Chevreuse’s turn to make a momentous announcement. He tells everyone that he has been married for a year, but has been keeping the marriage secret for fear that Richelieu, who had intended his chosen bride as the wife of his own ill-fated nephew, might seek to wage a private vendetta against him. The courtiers ask the identity of his wife, and he presents Maria to them. While all hasten to express their felicitations, Chalais is understandably shattered, and Maria herself dismayed at the pain she has inevitably caused him. At this point it is announced that the King has appointed Chalais his First Minister in Richelieu’s place, and desires his immediate attendance. All gather around to congratulate him, and the act ends in rejoicing as the entire court prepares to attend the King’s festivity in his mother’s honour. Only Chalais and Maria are unable to enter wholeheartedly into the mood of celebration. ACT TWO. A room in Chalais’ hôtel where, summoned home from the festivity by a call to attend his dying mother, he is writing a letter. He places it in a secret drawer in his desk, and instructs his secretary, Aubry, should he fail to return by dusk the following day, to force open the drawer and deliver the letter. He will find the name of the intended recipient inscribed upon it. (In lines that Donizetti did not set, he also gives Aubry a second letter, addressed to the King, in which he declines the position of First Minister since he realises that he is about to stain his reputation by fighting a duel.) He then fetches two pistols which he lays upon his desk. He listens intently for a moment outside his mother’s door, and expresses the thought that they may both re-meet in Heaven sooner than either of them had imagined. Aubry informs him that a cloaked and masked lady wishes to see him. Admitted, she throws off her mask and reveals herself as Maria. She has come, she tells him, to warn him that he must flee: Richelieu has succeeded in reinstating himself in the King’s good graces, so that he – Chalais – is now in eclipse and in danger of his life. At this point they are interrupted by the voice of Chevreuse, calling from outside. Maria is seized with alarm lest she be discovered, and Chalais hastily conceals her in a small side-room which serves as his armoury. Chevreuse has come to accompany Chalais to the duel. He objects, however, to a small ornamental sword which he sees lying on a table, and approaches the armoury to seek a more suitable weapon. Chalais in alarm stands in his way, and Chevreuse, seeing Maria’s mask, realises that he has interrupted an assignation. He declares that he has no wish to pry into his friend’s private affairs, and, urging all possible haste, takes his leave, saying that he will precede him to the Tour de Nesle. It is, understandably, a terrified Maria who emerges from the armoury. She has overheard everything, and pleads with Chalais to flee from Paris rather than fight the duel and face both the King’s displeasure and Richelieu’s persecution and revenge. Chalais remains adamant that his honour requires him to fight, and, as the Louvre clock strikes five, prepares to leave. Maria urges that his death, should he be killed, could very possibly precipitate his mother’s demise. He is about to yield to her pleading when loud knocking is heard outside, and the Viscount of Suze, his other second, calls to him, informing him that the hour fixed for the duel has passed, and that Chevreuse is preparing to fight in his place. His sense of honour reawakened, he seizes his pistols and races out. ACT THREE. A hall in Chevreuse’s hôtel. The duel has taken place, fought, as a result of Chalais’ tardy arrival, by Chevreuse. Gondì has been slain, and Chevreuse wounded in the arm. He assures Maria and Chalais that the injury is slight, and that his sole present concern is to secure his friend’s safety by smuggling him out of Paris. While he goes out to organise arrangements, Chalais receives a visit from an extremely concerned Aubry, who informs him that a detachment of archers has broken into his hôtel and discovered and confiscated all his carefully concealed papers. Chalais realises that the letter he had addressed to Maria – to all intents and purposes a compromising love-letter – will now be in Richelieu’s hands, and that Richelieu will have no hesitation in forwarding it to Chevreuse. A horrified Maria exclaims that Chevreuse will certainly kill her. Chalais urges that, when he has made his escape, she should join him outside the city. He promises to deliver her into the protection of her brother. Chevreuse reappears through a secret door, urging Chalais to accept this as his one sure way to safety: the door gives access to a passage which will lead him beyond the city walls where a horse awaits him. Chalais, in a final private word to Maria, insists that if she does not join him within the hour, he will return to die with her. Maria, left alone, reveals that she married Chevreuse only under pressure from her now-dead mother, for she has always been in love with Chalais. She prays to her mother to intercede with God on her behalf: only thus can she be saved from a bitter and violent death. Chevreuse, who has escorted Chalais to safety, returns, but his attempts to calm Maria are cut short when a servant announces that the Captain of the Archers, Fiesque, wishes to see him. A confused and fearful Maria takes her leave in response to a summons from the Queen, and Fiesque, expressing his hope that Chevreuse will reveal Chalais’ whereabouts, delivers the fatal letter. It contains a miniature portrait, and to his consternation Chevreuse recognises Maria’s likeness. Fiesque again presses him to reveals Chalais’ whereabouts, but receives the reply that – unfortunately – he has made his escape. Chevreuse orders a servant to overtake Maria and summon her back, but Fiesque sardonically replies that she is still in the hôtel – he had already given orders that no one should be allowed to depart. Chevreuse confronts a terrified Maria. He plays with her as a cat plays with a mouse, rehearsing to her the duties of a wife to her husband, and stressing that the only true penalty for infidelity is death. An increasingly demoralised Maria notes that his wound has begun to bleed afresh, and then, as the clock strikes the hour, she utters a cry and involunarily turns towards the secret door. In a flash Chevreuse realises that she is expecting or fearing that Chalais may return. The door opens and Chalais reappears, ready and willing to die. He draws a dagger and tries to commit suicide, but Chevreuse prevents him from doing so, claiming that his life is forfeit to him and him alone. The servant announces that the archers have returned and are clamouring for admission. Chevreuse orders that they be held back for as long as possible. Then, thrusting one of two pistols into Chalais’ hand and seizing the other himself, he drags his victim, half willing and half protesting, out through the secret door. Riccardo, Graf von Chalais, tritt auf. Nach einer langen Phase des Schweigens hat er schließlich einen kurzen Brief von der Frau seines Herzens erhalten: Maria, Gräfin von Rohan. Sie gehört zum Hofstaat der Königin und bittet ihn eindringlich, sie aufzusuchen. Als er ihrem Wunsch nachkommt, berichtet sie ihm, dass ihr Verwandter Enrico, Herzog von Chevreuse, vor einiger Zeit von einem hitzköpfigen Neffen Richelieus zum Duell herausgefordert wurde und diesen dabei tötete. Nun ist er Opfer des Gesetzes geworden, laut dem Duelle verboten sind, und ist zum Tod verurteilt. Die Gräfin fleht Chalais an, sein hohes Ansehen beim König einzusetzen und sich für Chevreuse zu verwenden. Nur er könne ihn noch vor dem Tod retten, doch müsse er schnell handeln, denn das Schafott solle am kommenden Morgen aufgebaut werden. Chalais vermutet zwar, dass er sich für einen Rivalen einsetzt, verspricht aber, seinen Einfluss nach Kräften geltend zu machen, und sucht den König auf, um seine Mission durchzuführen. Als Maria allein zurückbleibt, offenbart sie, dass Chevreuse weit mehr als nur ein Rivale Chalais’ ist: Seit einem Jahr sind sie insgeheim verheiratet. Die Höflinge tadeln sie wegen ihrer gedrückten Stimmung, doch als ein Page ihr ein Papier bringt, das sich als Chevreuses Begnadigung erweist, kann sie ihre Erleichterung kaum verbergen. Nachdem sie sich in die Gemächer der Königin zurückgezogen hat, tritt ein junger Höfling mit dem Namen Armando di Gondì auf. Mit seinem Erscheinen bei Hof setzt er sich dem Missvergnügen des Königs aus – und der Rache Richelieus, denn er diente bei dem schicksalhaften Duell als Chevreuses Sekundant. Die Gefahr tut er jedoch ab, denn er glaubt, dass Richelieus Sturz unmittelbar bevorstehe. Außerdem verachtet er den Kardinal, da er ihn als Rivalen betrachtet: So beharrlich er eine Frau auch umwirbt, sie ignoriert ihn und, schlimmer noch, er sah sie an einem einzigen Tag drei Mal Richelieus Palais betreten. Nach ihrem Namen gefragt, nennt er Maria, Gräfin von Rohan. Chalais, der gerade rechtzeitig zurückkehrt, um das zu hören, ist zutiefst gekränkt, dass der Name der geliebten Frau derart leichtfertig in den Schmutz getreten wird, und fordert Gondì auf der Stelle zu einem Duell heraus. Gondì nimmt an, weitere Unterhandlungen werden jedoch durch das Erscheinen Chevreuses unterbrochen, der gerade aus dem Gewahrsam entlassen wurde. Er begrüßt Chalais als seinen Retter, und sobald er vom bevorstehenden Duell erfährt, bietet er sich als Sekundant an. Als Austragungsort wird die Tour de Nesle bestimmt, als Zeitpunkt der folgende Tag im Morgengrauen. Maria tritt ein mit der Nachricht, dass Richelieu nun tatsächlich in Ungnade gefallen ist – das habe sie soeben von der Königin selbst erfahren. Daraufhin macht Chevreuse seinerseits eine bedeutsame Ankündigung und offenbart allen Versammelten, dass er seit einem Jahr verheiratet ist, die Vermählung aber verschwieg aus Angst, dass Richelieu, der seine Braut als Gemahlin seines unglückseligen Neffen auserkoren hatte, auf Rache sinnen könnte. Die Höflinge erkundigen sich nach der Identität seiner Frau, und er präsentiert ihnen Maria. Allseits werden Beglückwünschungen ausgesprochen, nur Chalais ist verständlicherweise am Boden zerstört, und Maria ist bedrückt wegen des Kummers, den sie ihm bereitet. In diesem Moment wird verkündet, dass der König Chalais an Richelieus Statt zu seinem Ersten Minister ernannt hat, und verlangt ihn sofort zu sehen. Alle umringen und beglückwünschen ihn, und der Akt endet in freudiger Stimmung, der Hof macht sich bereit für das Fest des Königs zu Ehren seiner Mutter. Nur Chalais und Maria können nicht aus vollem Herzen in den allgemeinen Jubel einstimmen. Ein Raum im Palais Chalais’. Seine Mutter liegt im Sterben, weshalb er vom Fest fort gerufen wurde. Nun schreibt er einen Brief, den er in ein Geheimfach seines Schreibtischs legt. Dann weist er seinen Sekretär Aubry an, sollte er bis zum Abend des kommenden Tags nicht zurückkehren, das Fach aufzubrechen und den Brief zuzustellen. An wen er gerichtet sei, habe er darauf vermerkt. (In einer von Donizetti nicht vertonten Textstelle reicht Chalais Aubry einen zweiten, an den König adressierten Brief, in dem er das Amt des Ersten Ministers ablehnt, denn ihm ist klar, dass er seinen Ruf durch das Duell beschädigt.) Daraufhin holt er zwei Pistolen und legt sie auf den Schreibtisch. Einen Moment lauscht er angestrengt an der Tür zum Zimmer seiner Mutter und überlegt laut, dass er und sie sich womöglich früher im Himmel wieder begegnen könnten, als sie sich je gedacht hätten. Aubry kommt mit der Nachricht, dass eine unter Maske und Umhang verborgene Dame ihn zu sehen wünsche. Sobald sie vorgelassen wird, nimmt sie die Maske ab und gibt sich als Maria zu erkennen. Sie sei gekommen, sagt sie, um ihn zur Flucht zu drängen: Richelieu sei es gelungen, die Gunst des Königs wieder zu erlangen, so dass nun er – Chalais – in Ungnade gefallen und sein Leben gefährdet sei. In diesem Moment dringt die Stimme Chevreuses zu ihnen vor, der von außen nach Chalais ruft. Panisch angesichts der Vorstellung, von ihrem Gemahl bei Chalais angetroffen zu werden, lässt Maria sich von ihm rasch in einem kleinen Nebenzimmer verstecken, das als Waffenkammer dient. Chevreuse ist gekommen, um Chalais zum Duell zu begleiten. Allerdings erhebt er Einspruch gegen das kleine Zierschwert, das er auf einem Tisch liegen sieht, und tritt zur Waffenkammer, um eine passendere Waffe zu suchen. Erschreckt stellt sich Chalais ihm in den Weg, und als Chevreuse Marias Maske sieht, wird ihm klar, dass er ein heimliches Rendezvous unterbrochen hat. Mit den Worten, er wolle sich nicht in die Privatangelegenheiten seines Freundes einmischen, bricht er allein zur Tour de Nesle auf, allerdings nicht ohne Chalais zu Eile zu mahnen. Maria ist verständlicherweise außer sich, als sie aus der Waffenkammer tritt. Sie hat das Gespräch mitgehört und fleht Chalais an, lieber aus Paris zu fliehen, als das Duell auszutragen und sich sowohl dem Missfallen des Königs als auch Richelieus Drangsal und Rache auszusetzen. Chalais beharrt darauf, dass er aus Gründen der Ehre kämpfen müsse, und als die Uhr des Louvre fünf schlägt, will er aufbrechen. Maria beschwört ihn, dass sein Tod, sollte er fallen, das Ableben seiner Mutter beschleunigen würde. Gerade will Chalais ihrem Flehen nachgeben, als von draußen lautes Klopfen zu hören ist, und der Vicomte von Suze, sein zweiter Sekundant, ruft ihm zu, dass die für das Duell angesetzte Stunde verstrichen sei und Chevreuse sich bereit mache, an seiner Statt zu kämpfen. Sein Ehrgefühl ist wieder geweckt, er greift nach den Pistolen und eilt davon. Ein Raum im Palais Chevreuses. Das Duell hat stattgefunden, wobei Chevreuse wegen Chalais’ Verspätung angetreten ist. Gondì ist tot, Chevreuse wurde am Arm verletzt. Er versichert Maria und Chalais, die Wunde sei vernachlässigenswert, seine einzige Sorge gelte seinem Freund, den er aus Paris hinausschmuggeln und in Sicherheit bringen wolle. Während er abtritt, um Vorkehrungen für die Flucht zu treffen, kommt ein äußerst besorgter Aubry zu Chalais und informiert ihn, dass ein Trupp Bogenschützen in sein Palais eingebrochen sei und alle sorgsam verwahrten Papiere konfisziert habe. Chalais wird bewusst, dass der Brief, den er an Maria geschrieben hat – und der sich durchaus als kompromittierender Liebesbrief verstehen lässt –, nun in Richelieus Hände gefallen ist und dieser nicht zögern wird, ihn Chevreuse zukommen zu lassen. Entsetzt ruft Maria, dass Chevreuse sie zweifellos töten wird. Chalais beschwört sie, sich ihm anschließen, sobald seine Flucht gelungen sei, und verspricht, sie in die Obhut ihres Bruders zu bringen. Chevreuse tritt durch eine Geheimtür ein und drängt Chalais, diesen Weg zu nehmen: Hinter der Tür liege eine Passage, die erst jenseits der Stadtmauern ins Freie gelange, und dort stehe ein Pferd für ihn bereit. In einem letzten kurzen Gespräch mit Maria sagt Chalais, wenn sie nicht innerhalb einer Stunde bei ihm sei, werde er zurückkehren, um mit ihr zu sterben. Allein gelassen gesteht Maria, dass sie Chevreuse nur auf Druck ihrer mittlerweile verstorbenen Mutter geheiratet habe, sie selbst habe immer Chalais geliebt. Sie betet zu ihrer Mutter, diese möge sich für sie bei Gott verwenden, nur er könne sie vor einem bitteren, gewaltsamen Tod bewahren. Chevreuse, der Chalais in die Sicherheit begleitet hat, kehrt zurück, aber seine Versuche, Maria zu beruhigen, werden unterbrochen, als ein Diener verkündet, der Hauptmann der Bogenschützen, Fiesque, wolle ihn sprechen. Verwirrt und voll Angst verabschiedet Maria sich, sie ist zur Königin gerufen worden, und Fiesque überreicht Chevreuse in der Hoffnung, dieser werde Chalais’ Versteck verraten, den kompromittierenden Brief. Das Schreiben enthält ein kleines Porträt, das Chevreuse zu seiner Bestürzung als das seiner Frau erkennt. Wieder drängt Fiesque ihn, Chalais’ Aufenthaltsort zu verraten, erhält aber nur zur Antwort, dieser sei – leider – geflohen. Chevreuse befiehlt einem Diener, Maria nachzueilen und zurückzubringen, aber Fiesque erklärt sardonisch, sie sei noch im Palais – er habe Befehl gegeben, dass niemand es verlassen dürfe. Dann steht eine völlig verängstigte Maria vor Chevreuse. Er spielt ein wahres Katz-und-Maus-Spiel mit ihr, führt ihr die Pflichten einer Frau gegenüber ihrem Gemahl vor Augen und erklärt, die einzig wahre Strafe für Untreue sei der Tod. Zunehmend verzweifelt merkt Maria, dass seine Wunde wieder zu bluten beginnt, und als die Uhr die volle Stunde schlägt, stößt sie einen Schrei aus und dreht sich unwillentlich zur Geheimtür. Sogleich wird Chevreuse klar, dass sie erwartet oder fürchtet, Chalais könnte zurückkehren. Die Tür öffnet sich, und Chalais tritt ein, bereit zu sterben. Er zieht einen Dolch und will sich hineinstürzen, doch Chevreuse hindert ihn daran und erklärt, es sei allein sein Recht, ihm das Leben zu nehmen. Der Diener verkündet, die Bogenschützen seien zurückgekehrt und verlangten lauthals Einlass. Chevreuse befiehlt, sie solange wie möglich aufzuhalten. Dann drückt er Chalais eine der beiden Pistolen in die Hand, nimmt selbst die zweite und zieht sein Opfer, halb willig und halb protestierend, zur Geheimtür hinaus. ATTO PRIMO. Il palazzo reale del Louvre, ai tempi di Luigi XIII e durante l’ascesa del primo ministro, Cardinale Richelieu. È notte. I signori e le dame di corte vedono impallidire la stella di Richelieu. La corte, finora luogo di tristezza e paura, sembra alla vigilia di una grande festa (veniamo a sapere in seguito che il re prepara la festa di compleanno per sua madre). Entra Riccardo, Conte di Chalais. Dopo un lungo silenzio ha ricevuto un messaggio dalla donna di cui è innamorato: Maria, contessa di Rohan, una delle dame della Regina, gli ha chiesto di incontrarlo urgentemente e gli rivela che un suo parente, Enrico, Duca di Chevreuse, è stato condannato a morte. Nonostante sia in vigore una legge che vieta i duelli, il Duca ha ucciso un nipote di Richelieu che l’aveva sfidato. Chalais è in buona luce presso il Re, e Maria lo supplica di intercedere per suo conto: solo lui può salvare la vita del Duca, ma deve agire in fretta perché il patibolo sarà innalzato il giorno dopo. Pur sospettando di agire a favore di un rivale, Chalais promette di esercitare la propria influenza per quanto possibile ed entra negli appartamenti del Re per svolgere la sua missione. Rimasta sola, Maria rivela che, oltre a essere rivale di Chalais, Chevreuse è suo marito: i due si sono segretamente sposati un anno prima. I cortigiani le chiedono il motivo della sua tristezza, ma quando un usciere le porta un foglio con la grazia per Chevreuse, si rallegra visibilmente e non riesce a nascondere il proprio sollievo. Quando si è ritirata negli appartamenti della Regina, entra Armando di Gondì, in aperta sfida al Re e a Richelieu, poiché è stato padrino di Chevreuse nel duello fatale. Ma il giovane non ha timore, perché è convinto che la caduta di Richelieu sia imminente e inevitabile, e parla con disprezzo del Cardinale, che considera suo rivale: la donna da lui assiduamente, ma vanamente corteggiata, è stata vista entrare nel palazzo di Richelieu tre volte in un solo giorno. Quando gli chiedono chi sia, dichiara che si tratta di Maria, Contessa di Rohan. Chalais, appena rientrato a questo punto, è profondamente offeso dalla leggerezza con cui sente sbandierare il nome della donna che ama e immediatamente sfida Gondì a duello. L’altro accetta, ma gli accordi sono interrotti dall’apparizione di Chevreuse, appena scarcerato, che saluta in Chalais il suo liberatore, e si offre di fargli da padrino nell’imminente duello. La sfida si svolgerà alla torre di Nesle, all’alba del giorno dopo. Entra Maria e annuncia che Richelieu è effettivamente in disgrazia: la notizia le è stata comunicata dalla Regina in persona. Adesso tocca a Chevreuse fare un annuncio importante: è sposato da un anno, ma ha tenuto segrete le nozze per timore di Richelieu. Il cardinale voleva che la donna da lui scelta sposasse il suo malaugurato nipote e avrebbe potuto cercare di vendicarsi segretamente. I cortigiani chiedono di conoscere l’identità di sua moglie e lui presenta Maria. Tutti si affrettano a congratularsi, Chalais è comprensibilmente distrutto, e Maria sconvolta per il dolore che gli ha inevitabilmente provocato. A questo punto giunge l’annuncio che il Re ha nominato Chalais primo ministro al posto di Richelieu e desidera immediatamente la sua presenza. Tutti si radunano per congratularsi e l’atto termina tra l’allegria generale, mentre l’intera corte si prepara a partecipare alla festa del Re in onore di sua madre. Solo Chalais e Maria non riescono a condividere fino in fondo l’atmosfera di festa. ATTO SECONDO. Una sala nel palazzo di Chalais, che è stato richiamato dalla festa al capezzale della madre morente. L’uomo scrive una lettera, la ripone in un cassetto segreto della sua scrivania e dice al suo segretario Aubry di forzarlo e consegnarla nel caso non dovesse ritornare la sera del giorno dopo. Troverà il nome del destinatario sulla busta. (In alcune battute che Donizetti non musicò, l’uomo consegna ad Aubry anche una seconda lettera, indirizzata al Re, in cui rifiuta la carica di Primo Ministro perché sa di macchiare la propria reputazione partecipando a un duello.) Poi porta due pistole, che poggia sulla scrivania. Ascolta attentamente per un attimo alla porta della camera di sua madre e si augura di poterla rivedere in paradiso, forse prima di quanto entrambi possano immaginare. Aubry gli annuncia l’arrivo di una signora avvolta in un mantello e mascherata che desidera vederlo. Dopo essere stata accompagnata nella stanza, la donna si toglie la maschera: è Maria, ed è venuta a chiedergli di fuggire. Richelieu è riuscito a riconquistare i favori del Re e adesso Chalais è in disgrazia; la sua vita è in pericolo. A questo punto li interrompe la voce di Chevreuse, che chiama da fuori. Maria teme di essere scoperta e Chalais la nasconde in tutta fretta in una saletta laterale che funge da armeria. Chevreuse è arrivato per accompagnare Chalais al duello. Rifiuta una piccola spada ornamentale che vede su un tavolino e si avvicina all’armeria per cercare un’arma più adatta. Allarmato, Chalais gli sbarra la strada e Chevreuse, vedendo la maschera di Maria, capisce di aver interrotto un appuntamento. Dichiara che non desidera interferire negli affari privati del suo amico, ma lo sollecita ad affrettarsi e si accomiata, dicendo che lo precederà alla torre di Nesle. Dall’armeria esce Maria, comprensibilmente terrorizzata. Ha sentito tutto e supplica Chalais di fuggire da Parigi piuttosto che partecipare al duello e affrontare lo sdegno del Re e la persecuzione e la vendetta di Richelieu. Chalais è irremovibile: deve lottare per difendere il suo onore e, mentre l’orologio del Louvre suona le cinque, si prepara a uscire. Maria insiste: se dovesse rimanere ucciso, la sua morte potrebbe affrettare quella di sua madre. L’uomo sta per cedere alle sue preghiere quando si sente bussare forte alla porta e l’altro padrino, il visconte di Suze, annuncia che l’ora fissata per il duello è passata: Chevreuse si prepara a prendere il posto di Chalais. Questo riaccende il suo senso dell’onore: l’uomo prende le pistole e corre fuori. ATTO TERZO. Una sala nel palazzo di Chevreuse. Il duello è terminato; a causa del ritardo di Chalais, Chevreuse ha combattuto; è rimasto ferito al braccio, ma Gondì è rimasto ucciso. Assicura Maria e Chalais che si tratta di una lieve ferita; la sua unica preoccupazione ora è per la salvezza dell’amico, e vuole aiutarlo a fuggire da Parigi. Mentre esce per prendere accordi, Chalais riceve la visita di Aubry, preoccupatissimo: un drappello di arcieri ha fatto irruzione in casa sua e scoperto e confiscato tutte le sue carte segrete. Chalais capisce che la lettera indirizzata a Maria – un compromettente messaggio d’amore – adesso cadrà nelle mani di Richelieu e il cardinale non esiterà a inoltrarla a Chevreuse. Maria è inorridita, certa che Chevreuse la ucciderà. Chalais le chiede a raggiungerlo fuori città e giura di affidarla a suo fratello, per non comprometterla. Rientra Chevreuse da una porta segreta e la indica a Chalais come sicura via di salvezza: la porta dà accesso a un corridoio che lo porterà oltre le mura della città, dove troverà un cavallo. In un ultimo dialogo privato con Maria, Chalais insiste: se lei non lo raggiunge entro un’ora, lui tornerà per morire con lei. Rimasta sola, Maria rivela che ha sposato Chevreuse solo per le insistenze della madre ormai defunta, ma ha sempre amato Chalais. Prega la madre di invocare Dio in suo favore: solo così potrà salvarsi da una morte crudele. Rientra Chevreuse, che ha accompagnato Chalais per metterlo in salvo, ma i suoi tentativi di calmare Maria sono interrotti quando un servo annuncia che De Fiesque, il capitano degli arcieri, desidera vederlo. Confusa e timorosa, Maria si allontana perché convocata dalla Regina, e De Fiesque, esprimendo la speranza che Chevreuse riveli dove si trova Chalais, gli consegna la lettera fatale, che contiene una miniatura. Chevreuse, costernato, riconosce il ritratto di Maria. De Fiesque chiede ancora con insistenza dove si trovi Chalais, ma l’uomo è ormai fuggito. Chevreuse ordina a un servo di raggiungere Maria e richiamarla, ma De Fiesque sardonicamente risponde che la donna è ancora nel palazzo: aveva già pensato lui a dare ordine di non fare allontanare nessuno. Chevreuse affronta Maria, terrorizzata, giocando con lei come il gatto con il topo, ricordandole i doveri della moglie nei confronti del marito e sottolineando che l’unica vera punizione per l’infedeltà è la morte. Sempre più demoralizzata, Maria nota che la ferita del marito ha ripreso a sanguinare, poi, mentre l’orologio batte l’ora, lancia un urlo e involontariamente si gira verso la porta segreta. Chevreuse capisce subito che aspetta o teme che Chalais possa ritornare. La porta si apre e ricompare Chalais, pronto a morire. Estrae una spada e cerca di uccidersi, ma Chevreuse glielo impedisce: la vita dell’avversario appartiene a lui. Il servo annuncia che gli arcieri sono tornati e chiedono a gran voce di entrare. Chevreuse ordina di trattenerli il più a lungo possibile. Poi, mette una delle due pistole in mano a Chalais, prende l’altra, e trascina fuori la sua vittima recalcitrante attraverso la porta segreta. Riccardo, comte de Chalais, fait son entrée. Il a reçu, après un long silence, un message pressant de la comtesse Maria de Rohan, jeune femme qui appartient à la Maison de la reine et dont il est épris, le conviant à un rendez-vous. À cette occasion, elle lui apprend qu’un de ses parents, Enrico, duc de Chevreuse, a tué l’impétueux neveu de Richelieu qui l’avait provoqué en duel ; cela lui a valu, la loi interdisant les duels, d’être condamné à mort. Maria supplie Chalais, qui a l’écoute du roi, d’intercéder au plus tôt en faveur de Chevreuse, promis à l’échafaud le lendemain. Conscient qu’il intervient peut-être en faveur d’un rival, Chalais promet de jouer de son influence et se dirige vers les appartements du roi dans ce but. Restée seule un instant, Maria révèle que Chevreuse est plus qu’un simple rival pour Chalais puisqu’elle l’a épousé en secret un an plus tôt. Alors que certains courtisans lui reprochent sa tristesse, elle reçoit un billet lui signifiant le pardon de Chevreuse. Elle s’abandonne à la joie tant son soulagement est grand, avant de rejoindre les appartements de la reine. Un jeune courtisan, nommé Armando di Gondì, se présente à la cour au risque de déplaire au roi – et de s’attirer la colère vengeresse de Richelieu en tant que second de Chevreuse lors du funeste duel. S’il s’est enhardi à le faire, c’est qu’il est convaincu de la chute inévitable et imminente de Richelieu. Il n’a, par ailleurs, que mépris pour le cardinal, qu’il considère comme un rival depuis qu’il a vu la femme à laquelle il fait en vain une cour assidue pénétrer à trois reprises dans l’hôtel particulier de Richelieu. Cette femme, c’est Maria, comtesse de Rohan, dit-il. Chalais, arrivé sur ces entrefaites et profondément offensé d’entendre le nom de Maria cité à la ronde avec tant de légèreté, provoque immédiatement Gondì en duel. Celui-ci accepte. Leur discussion est toutefois interrompue par l’arrivée de Chevreuse, fraîchement libéré, qui salue en Chalais son libérateur et, informé du duel prochain, offre de lui servir de second. Le combat aura lieu le lendemain à l’aube à la Tour de Nesle. Maria vient annoncer que la chute de Richelieu est un fait accompli – elle a appris la nouvelle de la bouche même de la reine. C’est maintenant au tour de Chevreuse de provoquer l’étonnement : il annonce à tous qu’il est marié depuis un an, mais que ce mariage est resté secret de peur que Richelieu, qui comptait faire épouser la jeune femme par son malheureux neveu, ne cherche à se venger. Aux courtisans qui s’enquièrent de l’identité de son épouse, il présente Maria. Les félicitations fusent, et voyant Chalais naturellement accablé par la nouvelle, Maria se désole de la douleur qu’elle lui a inévitablement causée. À ce moment précis, on apprend que Chalais est convoqué immédiatement par le roi, qui vient de le nommer premier ministre en remplacement de Richelieu. Chacun vient le féliciter de sa bonne fortune et l’acte s’achève dans une atmosphère de joie à la perspective des festivités prévues par le roi en l’honneur de sa mère. Seuls Chalais et Maria peinent à se joindre à l’allégresse générale. ACTE II. L’hôtel particulier de Chalais, où celui-ci, appelé au chevet de sa mère mourante, est en train d’écrire une lettre. Il place la missive dans un tiroir secret de sa table de travail et dit à son secrétaire, Aubry, qu’au cas où il ne serait pas encore de retour chez lui le lendemain soir, il faudrait ouvrir le tiroir de force et remettre la lettre à la personne dont le nom est indiqué. (Dans un passage dont la musique n’est pas de Donizetti, il remet à Aubry une deuxième lettre, adressée au roi, dans laquelle il refuse sa nomination au motif qu’il s’apprête à ternir sa réputation en se battant en duel.) Il se saisit des deux pistolets placés sur sa table puis, l’oreille collée à la porte de la chambre de sa mère, déclare qu’ils risquent de se retrouver ensemble au Paradis plus tôt qu’ils ne l’avaient, l’une et l’autre, imaginé. Aubry vient lui annoncer qu’une mystérieuse femme masquée demande audience. Arrivée devant lui, elle ôte son masque pour lui révéler son identité : c’est Maria, venue, dit-elle, le presser de fuir : Richelieu est parvenu à retrouver les faveurs du roi et Chalais, destitué, se trouve en danger de mort. La voix de Chevreuse retentit alors à l’extérieur. Maria, affolée, craint d’être découverte en ce lieu, aussi Chalais la fait-il rapidement se cacher dans une petite pièce voisine servant d’armurerie. Chevreuse est venu chercher Chalais pour l’accompagner sur le lieu du duel. À la vue d’une petite épée d’apparat sur la table, il se dirige vers l’armurerie en quête d’une arme plus appropriée. Chalais , effrayé, lui barre le chemin et Chevreuse, voyant le masque de Maria, comprend qu’il a interrompu un rendez-vous galant. Ne voulant pas s’immiscer dans les affaires de son ami, Chevreuse se retire sans plus attendre pour se rendre à la Tour de Nesle en lui prêchant la hâte. Maria sort de l’armurerie, évidemment terrifiée. Elle a tout entendu et supplie Chalais de fuir Paris plutôt que de se battre en duel et d’encourir le déplaisir du roi et les représailles de Richelieu. Chalais réaffirme que l’honneur exige qu’il se batte et se prépare à sortir tandis que cinq coups sonnent à l’horloge du Louvre. Maria lui rappelle que sa mort éventuelle risque de précipiter celle de sa vieille mère et, à ses mots, il semble fléchir. Mais voici que retentissent des coups bruyants frappés à la porte. Ce sont ceux du comte de Suze, autre second de Chalais, venu lui dire que l’heure du duel étant passée, Chevreuse s’apprête à combattre à sa place. Piqué dans son honneur, Chalais quitte la scène ses pistolets à la main. ACTE III. L’hôtel de Chevreuse. Le duel a eu lieu et c’est Chevreuse qui a livré combat. Gondì est mort et Chevreuse blessé au bras. Il rassure Maria et Chalais quant à sa blessure, et ajoute qu’il lui importe avant tout maintenant de mettre son ami en sécurité en lui faisant quitter Paris en secret. Tandis que Chevreuse se charge des préparatifs de fuite, Chalais reçoit la visite d’Aubry, très agité, venu lui annoncer qu’un détachement d’archers a pénétré de force dans son hôtel particulier et s’est emparé de tous les papiers qui s’y trouvaient cachés. Chalais comprend alors que la lettre qu’il destinait à Maria – et qui est, ni plus ni moins, une lettre d’amour compromettante – est désormais entre les mains de Richelieu et que celui-ci n’hésitera pas à la communiquer à Chevreuse. Accablé par la nouvelle, Maria s’écrie que Chevreuse ne manquera de vouloir la tuer. Chalais la presse de le rejoindre hors de la ville dès qu’il aura réussi à fuir et promet de la placer sous la protection de son frère. Chevreuse entre par la porte secrète qui permettra à Chalais de se sauver : elle mène, en effet, à un passage qui le conduira au-delà des murs de la ville où une monture l’attend. Chalais confie à Maria que si elle ne l’a pas rejoint dans l’heure qui suit, il reviendra mourir à ses côtés. Restée seule, la jeune femme révèle qu’elle a épousé Chevreuse pour répondre aux vœux de sa mère aujourd’hui décédée, mais qu’elle a toujours aimé Chalais. Elle s’adresse en prière à sa mère pour lui demander d’intercéder en sa faveur auprès du Divin, qui seul peut la sauver d’une mort cruelle et violente. De retour auprès d’elle après avoir mis Chalais en sûreté, Chevreuse tente de calmer Maria. Entre alors un serviteur venu lui annoncer que le capitaine des archers, Fiesque, souhaite s’entretenir avec lui. Confuse et apeurée, Maria se retire pour se rendre chez la reine qui la demande, tandis que Fiesque, remet à Chevreuse la lettre fatale dans l’espoir que celui-ci le conduira à Chalais. La lettre contient une miniature en laquelle Chevreuse, consterné, reconnaît le portrait de Maria. À Fiesque, qui insiste pour qu’il lui révèle où se trouve Chalais, Chevreuse répond qu’il a – malheureusement – réussi à s’échapper. Chevreuse dit à un serviteur d’aller rappeler Maria, mais Fiesque lui répond sardoniquement qu’il a déjà donné l’ordre qu’on ne laisse sortir personne et qu’elle n’a donc pas pu quitter les lieux. Chevreuse confronte une Maria terrifiée. Il joue au chat et à la souris avec elle, lui rappelant les devoirs qu’une femme doit à son époux et lui affirmant que seule la mort saurait punir l’infidélité. De plus en plus accablée, Maria remarque que la blessure de Chevreuse recommence à saigner puis, l’horloge ayant sonné l’heure, elle pousse un cri et se tourne involontairement vers la porte secrète. Chevreuse comprend immédiatement qu’elle attend ou craint le retour de Chalais. La porte s’ouvre et Chalais réapparaît, prêt à mourir. Il tire son poignard et tente de se donner la mort, mais Chevreuse l’en empêche en s’écriant que c’est à lui et à lui seul qu’il appartient de lui ôter la vie. Un serviteur annonce que les archers, de retour, tambourinent à la porte. Chevreuse ordonne qu’on retarde leur entrée aussi longtemps que possible. Puis, plaçant de force un de ses pistolets dans la main de Chalais, il se saisit de l’autre et entraîne sa victime, mi consentante mi rebelle, dans le passage secret.